Neal Porter Books, 9780823442836, 32pp. There is a ghost in my house. I've only seen it out of the corner of my eye, but I think it is a cat, says a little boy in this comforting tale of love and loss. There's something oddly familiar about this ghost cat--it does lots of things that remind the boy of the cat he used to have. The boy's not sure why the ghost cat never stays for more than a few moments, or why the ghost cat has visited him in the first place. He follows the ghost cat all over his house, until finally it leads him to something new and wonderful. 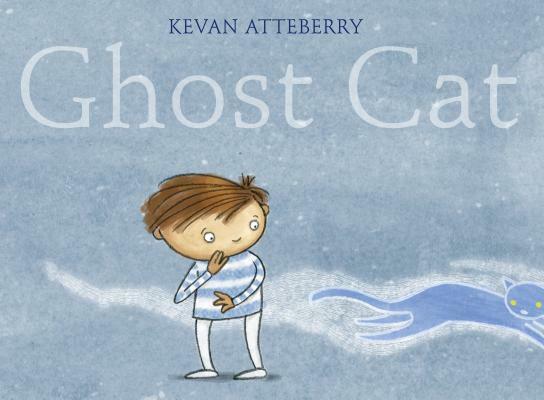 Bestselling author/illustrator Kevan Atteberry's artwork and story strike a perfect balance of evocative and haunting, as well as warm and hugely comforting to anyone struggling to cope with a loss. With a few carefully chosen words and simple, expressive illustrations, Ghost Cat captures both the poignancy of losing a pet and the importance of moving on without erasing or forgetting what came before. Kevan Atteberry is a commercial illustrator who has written and/or illustrated several bestselling books for children, including Puddles!! !, Bunnies!! !, Tickle Monster, and Boogie Monster. He lives in the Seattle area.